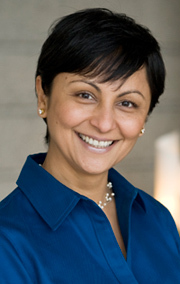 Dr. Anisha Kahai, DDS, provides comprehensive restorative care focusing on aesthetics, and is dedicated to the highest quality of patient care via an interdisciplinary team approach for advanced, complex treatment, including implants, crowns, bridges, veneers, dentures and implant retained dentures. Dr. Kahai was invited to join Pacific Dental Associates because of her strong communication skills, characteristic warmth, and commitment to excellence. She speaks French, Hindi, and Punjabi, has traveled extensively around the world, and lives with her husband and dachshund in San Francisco. She looks forward to welcoming you to her practice and being a part of your long-term dental health. Dr. Kahai is a member of the prestigious Academy of Osseointegration, in addition to being member of the American Dental Association, the California Dental Association and the San Francisco Dental Society. She stays current with the latest advancement in dentistry through her involvement in the nation's leading study club - the Spear Study Club, and the local and highly regarded Bay Area Aesthetic Masters. She graduated from the University of Pacific Dugoni School of Dentistry, where she also served on the faculty. As a member of AO (Academy of Osseointegration), Dr. Kahai offers advanced specialized knowledge about the science and clinical applications of implant dentistry. Learn more about dental implants and AO.